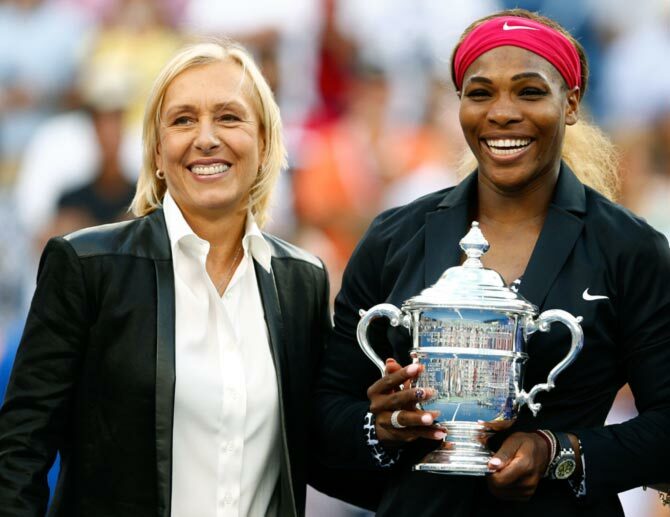 Multiple Grand Slam winner Martina Navratilova questioned the "silence" of the International Tennis Federation after one of its members described world number one Serena Williams and older sister Venus as "brothers". Russian Tennis Federation president Shamil Tarpischev was swiftly banned for a year and fined $25,000 by the Women's Tennis Association (WTA) after making the comments on local television on Friday. Navratilova, one of the game's greats with a total of 59 Grand Slam singles, doubles and mixed doubles titles, praised the speedy action by the WTA to defend Serena and former world number one Venus, winner of seven Grand Slam singles title, but was critical of the ITF. "The silence from the ITF has been pretty deafening," she told a small group of reporters in Singapore ahead of the start of the WTA Finals on Monday. "They are the ones who have actually the possibility of doing something as Tarpischev is head of the Russian Tennis Federation, which falls under the ITF and is also Fed Cup captain which falls under the ITF. "The WTA has done all they can do. They certainly have shown they have Serena’s back and Venus’ back and he might have thought the comment was funny but it was anything but. "Certainly this kind of bullying comment cannot be tolerated from anyone, but particularly from a high up official in the tennis world." Tarpischev, also an International Olympic Committee member, offered an apology on Saturday at the behest of the WTA, whose chief executive Stacy Allaster said the comments were "insulting, demeaning and have absolutely no place on our sport". Serena Williams, winner of 18 Grand Slam singles titles, was clearly hurt when she labelled the comments by Tarpischev as "very insensitive and extremely sexist as well as racist" prior to the defence of the season-ending title. "I thought they were in a way bullying," she added on Sunday. Asked by Reuters for their view, the ITF said they hoped Tarpischev's WTA punishment and apology to the Williams sisters, who have teamed up to win 13 Grand Slams and three Olympic gold medals in doubles, could draw a line under the incident. "The ITF was very disappointed when it learned that Shamil Tarpischev, longtime President of the Russian Tennis Federation, made derogatory remarks about the gender of Serena and Venus Williams," ITF president Francesco Ricci Bitti said. "What Mr. Tarpischev said was wholly unacceptable to the ITF and, when we learned of the issue, we encouraged him to apologise immediately. "Although Mr. Tarpischev assured us that his comment was meant as a joke, we made it clear to him that what he said is inappropriate in any context. "We hope that his acceptance of fault in this matter, which includes the penalty assessed by the WTA Tour, will allow all of us to move forward." Is Serena Williams better than Steffi Graf?